BARBOURSVILLE, W.Va. — A Barboursville police report released Friday said police recently found a former federal administrative law judge, who has been under investigation, in his car barely breathing after what may have been a suicide attempt. Retired Social Security Administrative Law Judge David Daugherty has been under fire since a 2011 report. Various media reports Saturday detailed the police report concerning David Daugherty. That report said he was found unconscious in his car Monday afternoon in a Barboursville church parking lot. Judge Daugherty retired in 2011 shortly after a story in the Wall Street Journal focused on the high rate in which he approved Social Security disability cases. 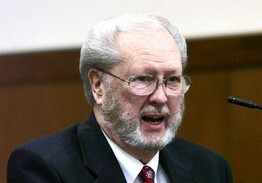 Judge Daugherty was placed on leave after the story broke. Allegations of fraud have been under investigation by a U.S. Senate committee. The committee recently held a congressional hearing. The fraud is so rampant, and disability cases have so proliferated in recent years, that the Social Security's Disability Trust Fund may run out of money in only 18 months, says Sen. Tom Coburn, R-Okla., whose office undertook the investigation. Coburn’s report on widespread fraud focuses in large part on a veritable "disability claim factory" allegedly run by Attorney Eric C. Conn out of his small office in Stanville, Kentucky, a region of the country where 10 to 15 percent of the population receives disability payments. The report documents how Attorney Conn allegedly worked together with Social Security Administrative Law Judge David Daugherty (ALJ) and a team of favored doctors with checkered pasts, including suspended licenses in other states, who rubber stamped approval of disability claims. In most cases, the claims had been prepared in advance with nearly identical language by staffers in Conn's law office. In 2010, the last year for which records are available, Judge Daugherty approved 1375 disability cases prepared by Attorney Conn's office and denied only 4 of them - an approval rate that other administrative law judges have described as nearly impossible. Judge Daugherty, 75 years old, processed more cases than all but three judges in the U.S. He had a wry view of his less-generous peers. “Some of these judges act like it’s their own damn money we’re giving away,” Mr. Daugherty told a fellow Huntington judge, Algernon Tinsley, who worked in the same office until last year, Mr. Tinsley recalled. Judge Daugherty was a standout in a judicial system that has lost its way, say numerous current and former judges. Judges say their jobs can be arduous, protecting the sometimes divergent interests of the applicant and the taxpayer. Some former judges and staff said one reason Judge Daugherty was allowed to continue processing so many cases was because he single-handedly helped the office hit its monthly goals. Staff members can win bonuses and promotions if these goals are surpassed as part of performance reviews. Critics blame the Social Security Administration, which oversees the disability program, charging that it is more interested in clearing a giant backlog than ensuring deserving candidates get benefits. Under pressure to meet monthly goals, some judges decide cases without a hearing. Some rely on medical testimony provided by the claimant’s attorney. The report found, "Judge Daugherty telephoned the Conn law firm each month and identified a list of Mr. Conn’s disability claimants to whom the judge planned to award benefits. Judge Daugherty also indicated, for each listed claimant, whether he needed a “physical” or “mental” opinion from a medical professional indicating the claimant was disabled." The report says that when Senate staffers and the Social Security Administration’s Office of the Inspector General began an investigation based on tips from whistle blowers, Attorney Conn and Judge Daugherty began communicating with disposable, pre-paid cell phones. It also alleges they contracted with a local shredding company to destroy 13 tons of documents. Attorney Conn also allegedly destroyed all the computer hard drives in his office. Attorney Conn's legal fate is now in the hands of the Justice Department. The alleged fraud highlights an endemic problem in Social Security disability benefit awards. The Coburn report says a random examination of 300 case files by Congressional staff found more than a quarter of the case files “failed to properly address insufficient, contradictory, or incomplete evidence,” suggesting a high rate of fraud or abuse. Daugherty served as a Cabell County circuit judge for 7 years beginning in 1977. Judge Daugherty paid 90+% of of his cases and processed 80 to 100 cases per month, mostly without holding hearings. When he held assembly-line hearings, they lasted no more than 15 minutes each. The Office numbers looked good to the Commissioner of Social Security. But the other ALJ who held 8 hearings a day of an hours duration each could only produce 20 decisions per month. He did not help to "pay down the backlog" and make the Office look good to the Commissioner; so, he was investigated and maybe brought up on charges for time and attendance violations. ALJ Daugherty was rewarded and the other ALJ was punished. That was what the Social Security System wanted and condoned and that is how the System worked until complaints from disgruntled staff members led to a Congressional Investigation. Judge Daugherty is not a 'Lone Ranger'. Other ALJs in other Hearing Offices are doing the same thing. They are paying down the backlog.